This week’s edition of Batteries Are Dangerous brings us to the great state of New Jersey, where a Bluetooth speaker recently started burning on a girl’s bed and then exploded. Thankfully, nobody was hurt, and the house didn’t burn down. The incident still serves as a cautionary tale for us all. She said they didn’t know what to do; her daughter grabbed an oven mitt and paper bag. They threw the device in the bag and brought it out to the apartment stairwell, where the mother said the device “popped” and burst into flames. Quick thing here: Putting anything that’s smoking into a paper bag is not a great idea. Paper is very flammable. Then again, nobody should have to worry about their gadgets exploding. The risk of devices with lithium-ion batteries isn’t going away any time soon, though. Upon even closer inspection, you can clearly see “NFC” written in large white letters on the bottom of the device. If the speaker is indeed a JBL Pulse, this is where the NFC plate would be. However, some images of authentic Pulses show the NFC logo to be small and black on the device. This raises the possibility that the New Jersey family may have owned a counterfeit JBL Pulse. A quick Google search shows that counterfeit JBL speakers are pretty common. We’ve reached out to JBL to learn more details about the incident. The company says that it’s “looking into the matter” and will soon provide more details about what happened in New Jersey. 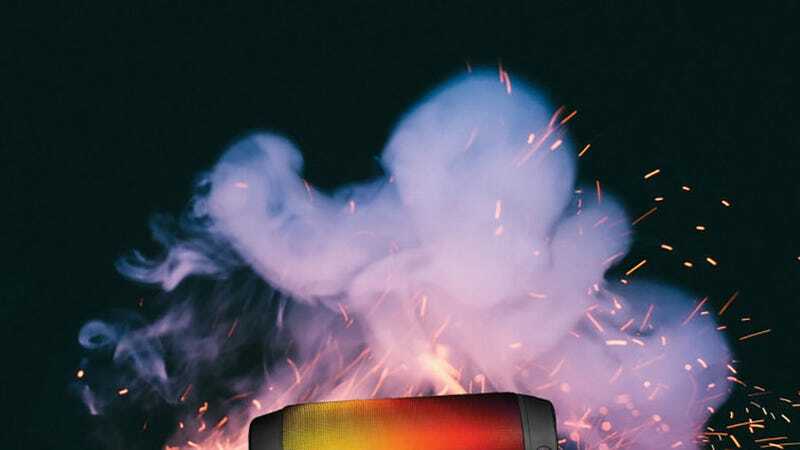 Meanwhile, the Consumer Product Safety Commission (CPSC) told Gizmodo that there have been other reports of exploding Bluetooth speakers, although the agency wasn’t able to confirm which brands were involved. We’ll update this post as soon as we learn more details. In the meantime, be careful with batteries. They’re dangerous. JBL is committed to the quality and performance of our products and we take this incident very seriously. We have reached out to this customer to determine whether the product is authentic and to gather more details. Update 04.02.2017 - JBL informed us that, after talking to the Cliffside Fire Department, the speaker involved in the incident “does not appear to be a JBL product.” According to fire department, the device “has not JBL branding on it.” This further suggests that it may have been a knock-off, designed to look like a JBL speaker. Or it may have just been a really crappy Bluetooth speaker.